Clark Inciarte was designated as Pequiven's CEO in august 2009. And by a recent Chavez decision he is no longer the head of Pequiven. The CEO's has a tight control with the Public Relations office of the company. 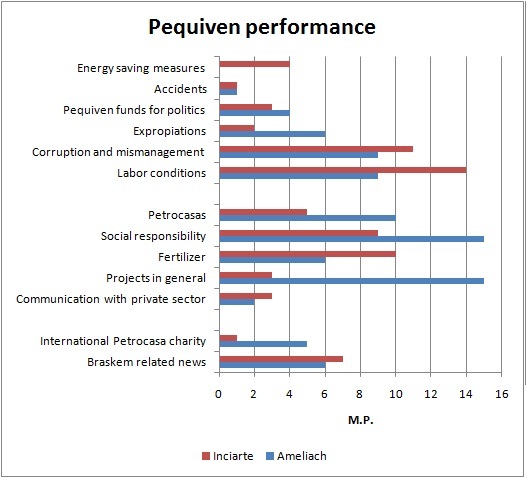 By taking a look at the news from august 2008 to august 2009 we will obtaine Ameliach's Pequiven, and from august 2009 to today, we will have Inciarte's vision of Pequiven. The different colors correspond either to Ameliach or Inciarte, and the height of the bars correspond to a measure of how many newspaper published (M. P.) the same information. Therefore if 8 different newspaper published an increase in fertilizant output the bar will be higher than if only 2 newspaper did it. 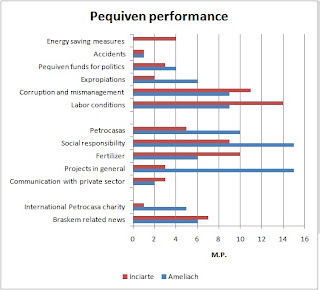 By taking a look at the graph you can notice that Inciarte came in the worst moment for the projects, and didn't have it easy either with the labor unions. Apparently, Inciarte's reality went different as Chavez's reality, as the social responsability and Petrocasas investment indicates, and this could be a more plausible cause than to act by himself without the government permission.